This open source solution monitors your cloud infrastructure simply and efficiently. Sensu is an open source infrastructure and application monitoring solution that monitors servers, services, and application health, and sends alerts and notifications with third-party integration. Written in Ruby, Sensu can use either RabbitMQ or Redis to handle messages. It uses Redis to store data. If you want to monitor your cloud infrastructure in a simple and efficient manner, Sensu is a good option. It can be integrated with many of the modern DevOps stacks your organization may already be using, such as Slack, HipChat, or IRC, and it can even send mobile/pager alerts with PagerDuty. 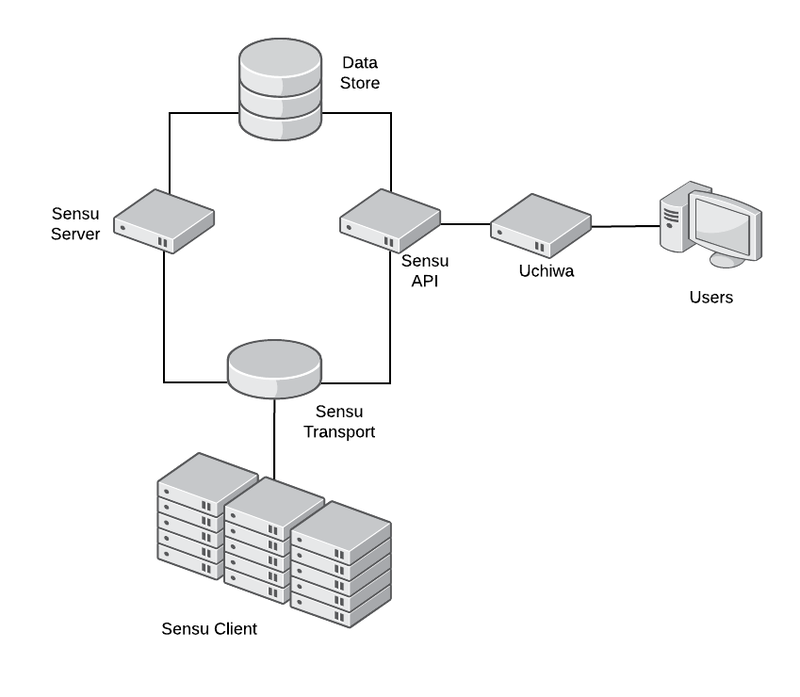 Sensu's modular architecture means every component can be installed on the same server or on completely separate machines. Sensu's main communication mechanism is the Transport. Every Sensu component must connect to the Transport in order to send messages to each other. Transport can use either RabbitMQ (recommended in production) or Redis. Sensu Server processes event data and takes action. It registers clients and processes check results and monitoring events using filters, mutators, and handlers. The server publishes check definitions to the clients and the Sensu API provides a RESTful API, providing access to monitoring data and core functionality. Sensu Client executes checks either scheduled by Sensu Server or local checks definitions. Sensu uses a data store (Redis) to keep all the persistent data. Finally, Uchiwa is the web interface to communicate with Sensu API. Redis is now installed and ready to be used by Sensu. In these two files, we configure Sensu to use Redis as the transport mechanism and the address where Redis will listen. Clients need to connect directly to the transport mechanism. These two files will be required on each client machine. In this file, we configure Uchiwa to listen on every interface (0.0.0.0) on Port 3000. We also configure Uchiwa to use sensu-api (already configured). For production environments, it’s recommended to run a cluster of RabbitMQ as the Transport instead of Redis (a Redis cluster can be used in production too), and to run more than one instance of Sensu Server and API for load balancing and high availability. Sensu is now installed. Now let’s configure the clients. To add a new client, you will need to enable Sensu repository on the client machines by creating the file /etc/yum.repos.d/sensu.repo. In the name field, specify a name to identify this client (typically the hostname). The environment field can help you filter, and subscription defines which monitoring checks will be executed by the client. Sensu checks have two components: a plugin and a definition. Sensu is compatible with the Nagios check plugin specification, so any check for Nagios can be used without modification. Checks are executable files and are run by the Sensu client. Check definitions let Sensu know how, where, and when to run the plugin. Let’s install one check plugin on the client machine. Remember, this plugin will be executed on the clients. With this information, we can now create the check definition on the server. In the command field, use the command we tested before. Interval will tell Sensu how frequently, in seconds, this check should be executed. Finally, subscribers will define the clients where the check will be executed. Restart both sensu-api and sensu-server and confirm that the new check is available in Uchiwa. Sensu is a powerful tool, and this article covers just a glimpse of what it can do. See the documentation to learn more, and visit the Sensu site to learn more about the Sensu community. Michael Zamot - Michael Zamot is an open source enthusiast whose passion began in 2004, when he discovered Linux. Ever since then he has worked and played with various open source projects, including Linux, OpenStack, OpenShift/Kubernetes and many more, and participated in community events by teaching, conducting workshops, and providing technical support and mentorship. He currently works for Red Hat as a Cloud Consultant, designing, deploying, and supporting complex cloud solutions.